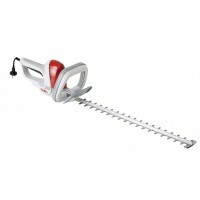 CORTASETOS ELECTRICO IKRA MOGATEC FHS 1555 CON ESPADA DE ACERO FLEXIBLE ESPECIAL TEMPLADO Y CORTADO CON LASER. CORTES LIMPIOS DE ALTA TRACCION Y MAYOR VIDA UTIL DE LA CUCHILLA. IDEAL PARA CORTAR SETOS Y ARBUSTOS EN JARDINES, PARQUES, ARBUSTOS DE CERCAS. ETC. MOTOR: ELECTRICO 230 V. CON 550 W. INTERRUPTOR "POWER SWICH" PARA CORTAR CON MAS POTENCIA. ESPADA: DE ACERO FLEXIBLE ESPECIAL TEMPLADO Y CORTADO CON LASER. CORTES LIMPIOS DE ALTA TRACCION Y MAYOR VIDA UTIL DE LA CUCHILLA. DIAMETRO MAX. DE CORTE: 24 MM.